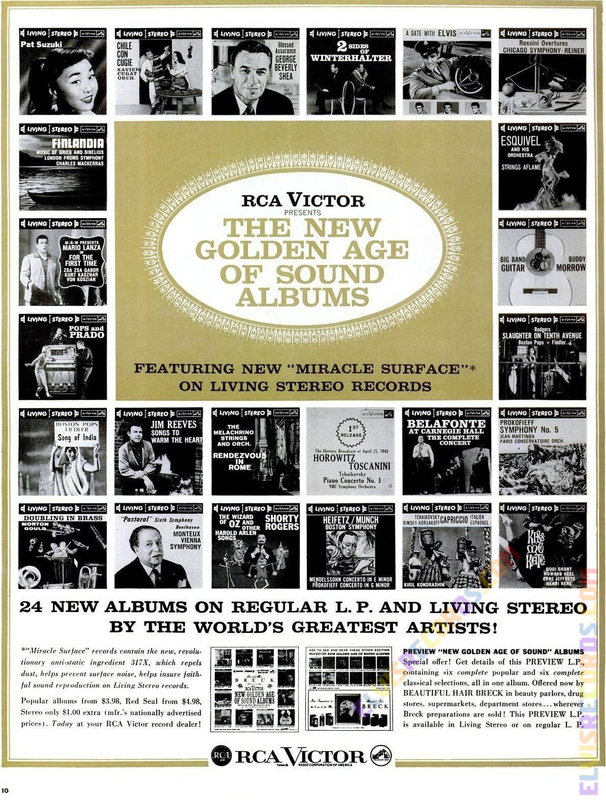 Here are a couple of articles and and advertisements that introduce the Golden Age of Sound. 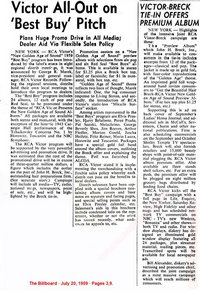 "New Golden Age of Sound" 1959 "Best Buy" program has been introduced by the label's execs... 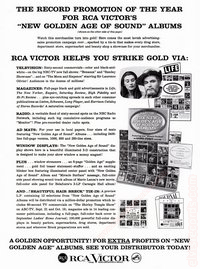 The "Best Buy" program includes 24 albums, 12 each of pop and Red Seal, to be promoted under the theme of "RCA Victor Presents the New Golden Age of Sound Albums." 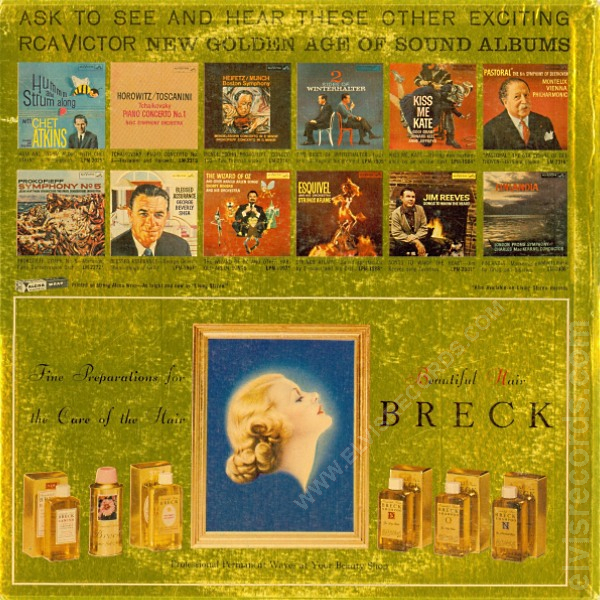 All packages are available both stero and monaural, with the exception of the historic 1943 Carnegie Hall performance of the Tchaikovsky Concerto No. 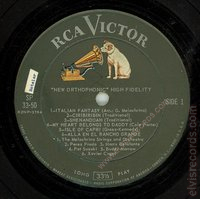 1 by Horowitz, Toscanini and the NBC Symphony. 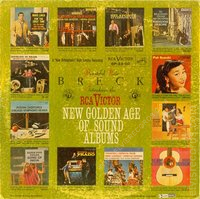 Promotion centers on a "New Golden Age of Sound' preview album with selections from six pop and six Red Seal "Best Buys" albums. 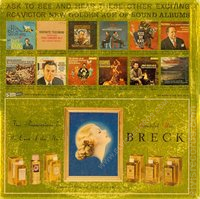 This is available in stereo for $1.25 plus a Breck box top, label or facsimile; for $1 in monaural, with box top, [label or facsimile]. 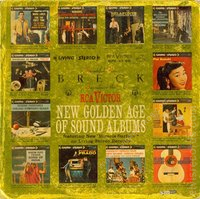 "Golden Age of Sound" theme reflects two lines of thought..: the consumer response to Living Stereo, and ... the introduction of RCA Victor's static-less "Miracle Surface" sticker. 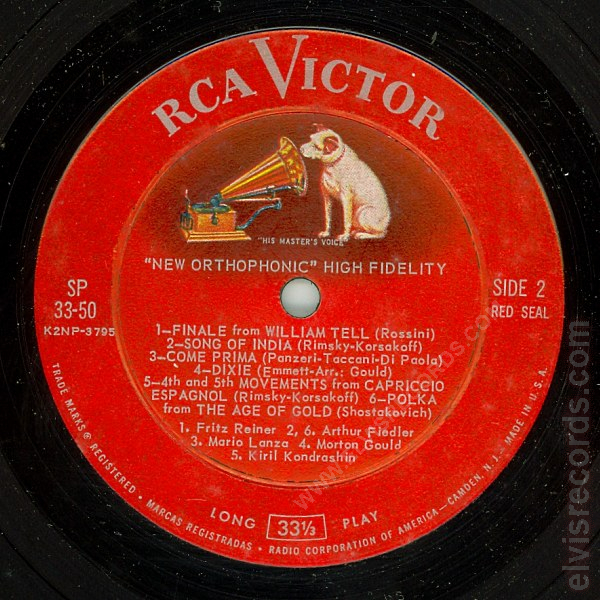 Among artists represented in the "Best Buys" program are Elvis Presley, Harry Belafonte, Perez Prado, Pat Suzuki, Melachrino, George Beverly Shea, Jim Reeves, Arthur Fiedler, Morton Gould, Jascha Heifetz, Fritz Reiner, Mario Lanza, Horowitz and Toscaninin. 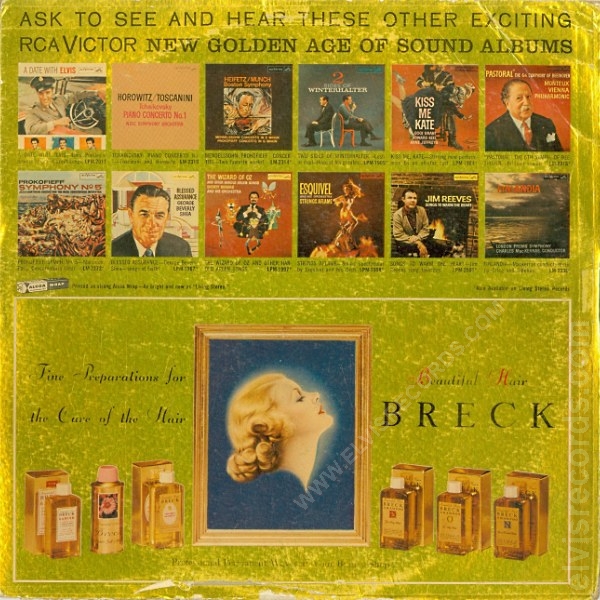 Packages have a special gold foil band around the album covers, outlining the Breck offer and explain in the theme. Foil was furnished by ALCOA. 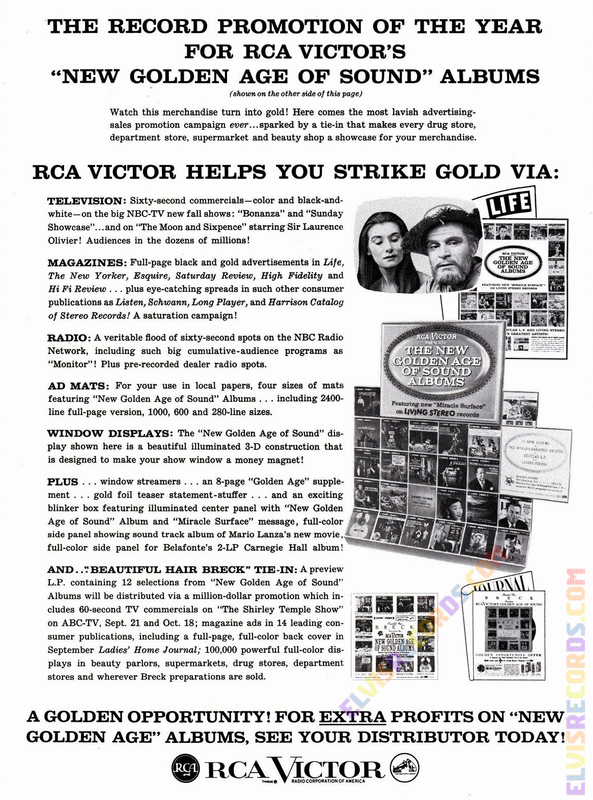 ... RCA Victor kicks off the "Best Buy" campaign with a full page in Life ..
24 brand-new albums on regular L.P. and Living stereo with New "Miracle Surface" by the World's Greatest Artists in finish High Fidelity. Your best-sellers for fall! 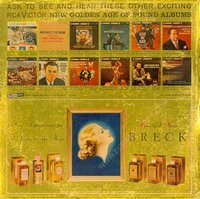 ... "Beautiful Hair Breck" tie-in: A preview L.P. containing 12 selections form "New Golden Age of Sound" Albums will be distributed via a million-dollar promotion which includes 60-second TV commercials ...; magazine ads ...; 100,000 powerful full-color displays in beauty parlors, supermarkets, drug stores, department stores and wherever Breck preparations are sold. 24 New Albums on Regular L.P. and Living Stereo by the World's Greatest Artists! "Miracle Surface" records contain the new, revolutionary anti-static ingredient 317X, which repels dust, helps prevent surface noise, helps insure faithful sound reproduction on Living Stereo records. 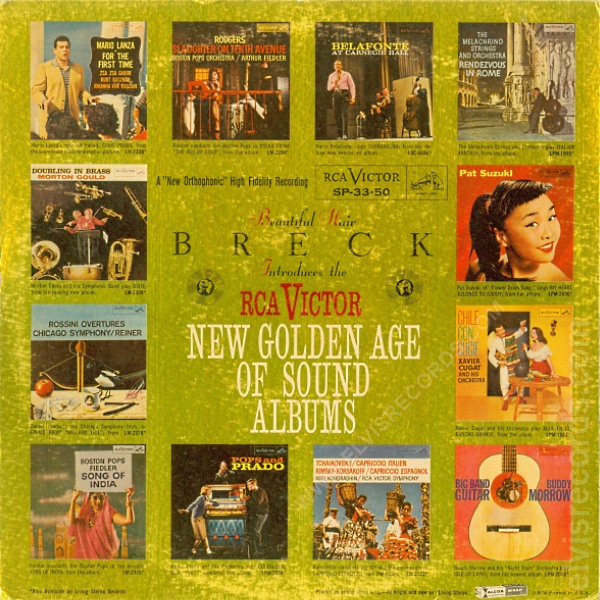 Popular albums from $3.98, Red Seal from $4.98, Stereo only $1.00 extra (mfr. 's nationally advertised prices). 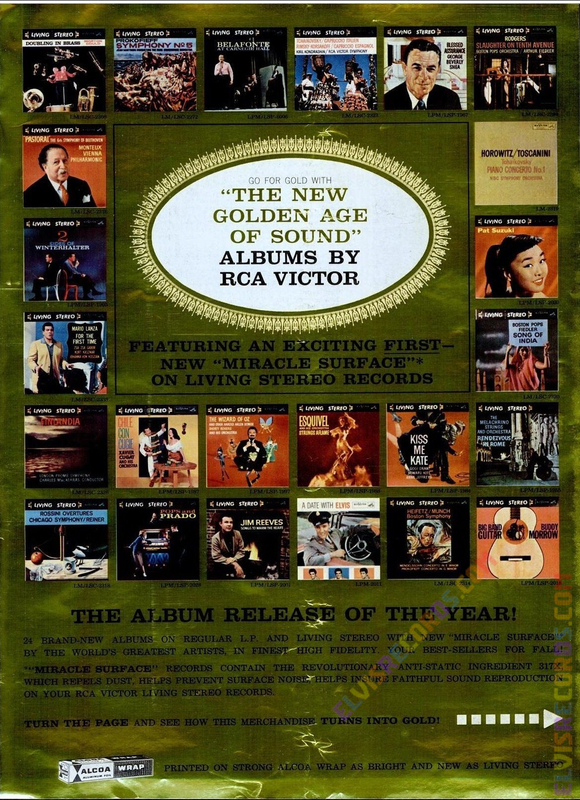 Today at your RCA Victor dealer! Special offer! 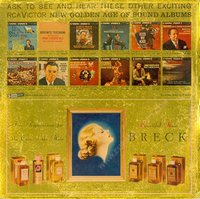 Get details of this PREVIEW L.P., containing six complete popular and six complete classical selections, all in one album. Offered now by BEAUTIFUL HAIR BRECK in beauty parlors, drug stores, supermarkets, department stores ... wherever Breck preparations are sold! This PREVIEW L.P. is available in Living Stereo or regular L.P. 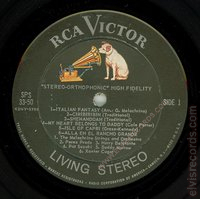 The complete list of the 24 25 albums available in both the Living Stereo and regular L.P. formats. These are examples of the Long Play and Living Stereo preview albums, released by RCA Victor as part of the Breck and the "New Golden Age of Sound Albums" promotion. 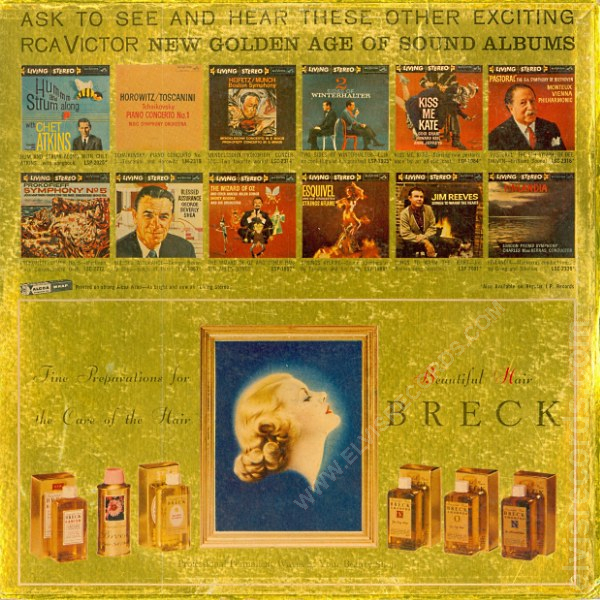 What is interesting is that the original promotion as detailed in July 1959 indicates that of the 24 featured albums, only the Tchaikovsky Concerto No. 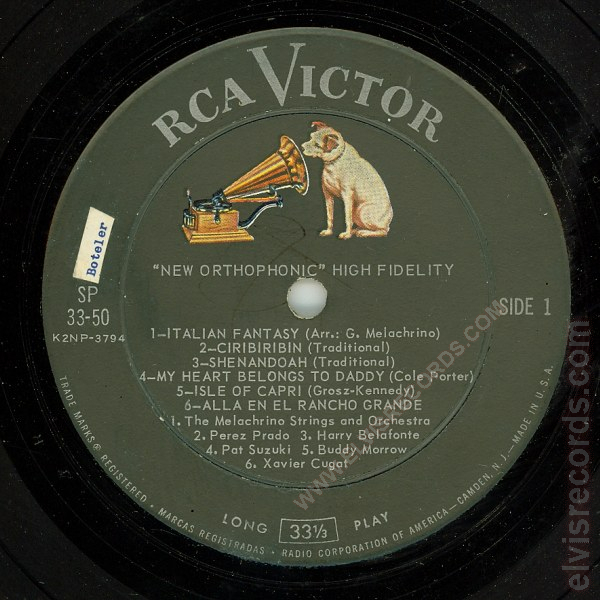 1 by Horowitz, Toscanini and the NBC Symphony would be released in regular L.P. (LM-2319) or long play monaural format, then continues to list Elvis Presley as being part of the promotion. Additional promotional material featured in Billboard and Life, as referenced above, depict Elvis Presley's A Date with Elvis (LPM-2011) as part of the promotion. This Elvis release would make it a second regular release L.P. Having discovered two different cover backs for the long play monaural format, one with Elvis Presley's A Date with Elvis (LPM-2011) in the upper left corner and another Chet Atkins' Hummm and Strum Along with Chet Atkins (LPM-2025) and in living stereo Chet Atkins' Hummm and Strum Along with Chet Atkins (LSP-2025), I believe that Elvis Presley was replaced with Chet Atkins from the New Golden Age of Sound Albums promotion. Cover Front: Printed on Gold Alcoa Wrap. 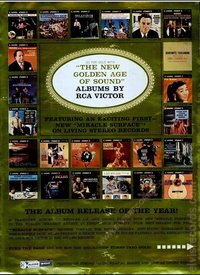 Featuring the 12 album covers of the artists featured on this LP. Cover Back: Printed on Gold Alcoa Wrap. 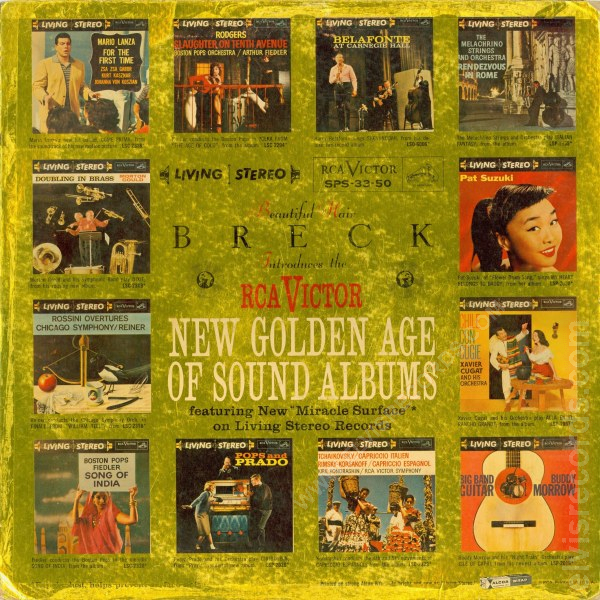 Featuring the other 12 album covers that are available as part of the New Golden Age of Sound promotion. There are two versions of the back. 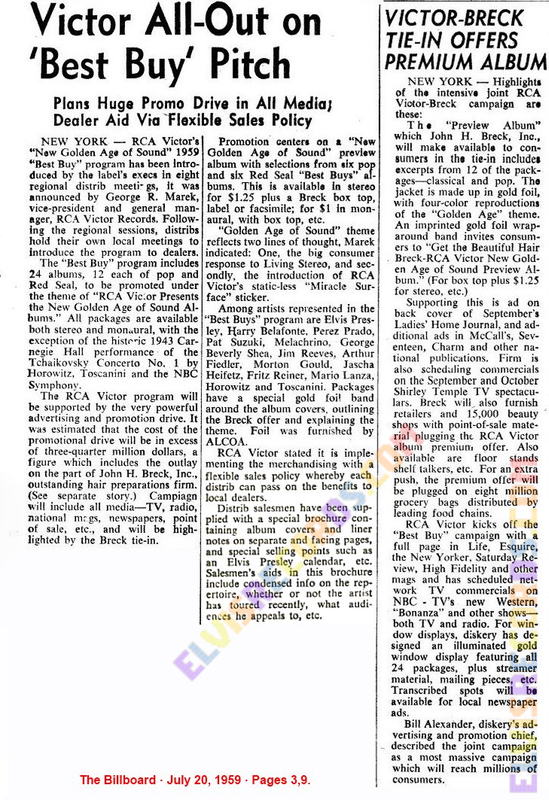 The first back features Elvis Presley's A Date With Elvis LPM-2011. It was replaced with Chet Atkins' Hummm and Strum Along with Chet Atkins LPM-2025. Disc: Black label. Dog on top. Long Play on bottom. / Red label. Dog on Top. Long Play on bottom. Cover Back: Printed on Gold Alcoa Wrap. 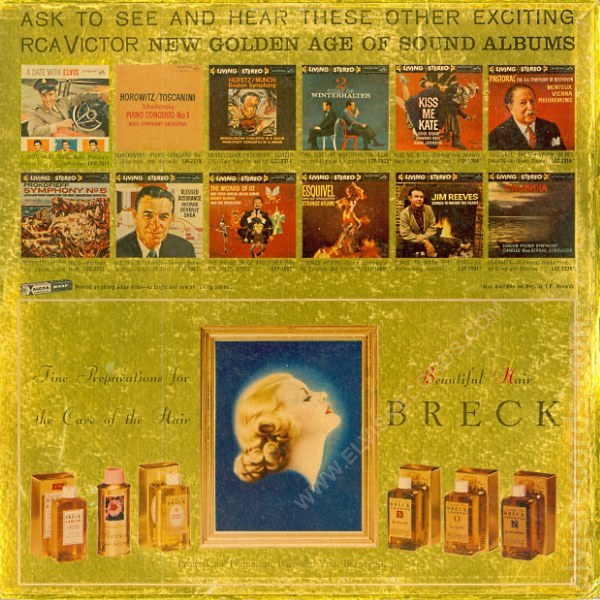 Featuring the other 12 album covers that are available as part of the New Golden Age of Sound promotion. There are two versions of the back. The first back features Elvis Presley's A Date With Elvis LPM-20115. It was replaced with Chet Atkins' Hummm and Strum Along with Chet Atkins LSP-2025. Disc: Black label. Dog on top. 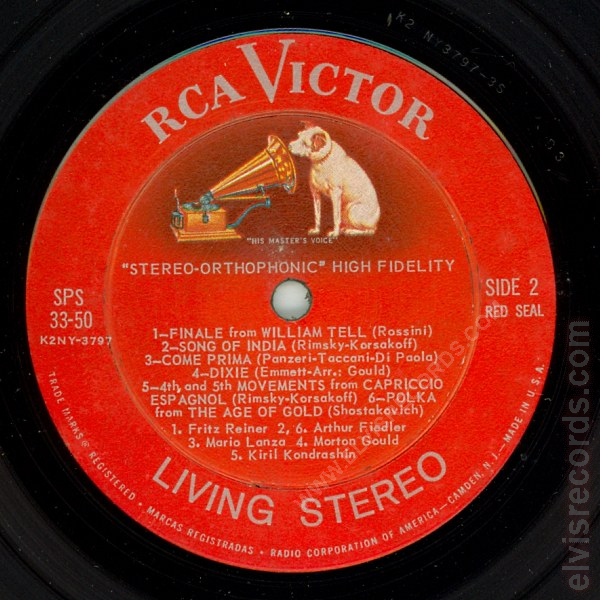 LIVING STEREO on bottom. / Red label. Dog on Top. 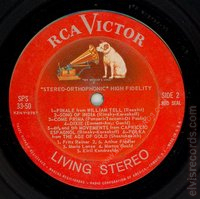 LIVING STEREO on bottom. Check out the monaural release of LPM-2011 A Date With Elvis from July 24, 1959. 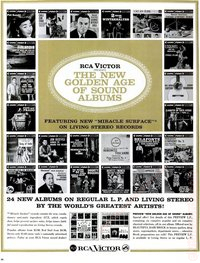 There are images of the "New Golden Age of Sound" banners.